2. The role of law and the constitution in Canada. In an era where the Supreme Court of Canada has become the “Official Opposition”, this article raises issues worth considering. This entry was posted in Uncategorized on July 14, 2014 by renounceuscitizenship. Efforts to ramp up the U.S. financial intelligence unit’s enforcement of the Bank Secrecy Act have run into a longstanding hurdle: the bureau’s reliance on financial regulators for case leads. Under the directorship of former federal prosecutor Jennifer Shasky Calvery, the Financial Crimes Enforcement Network’s once-separate compliance and enforcement functions have been combined into a single office within the new Division of Enforcement. The bureau, known as FinCEN, has staffed the division with former federal prosecutors. The division’s establishment came as part of a bureau-wide reorganization that commenced in June 2013, and a subsequent hiring campaign intended to enhance the issuance of warning letters, injunctions and civil money penalties against institutions and individuals that violate U.S. anti-money laundering (AML) rules. This entry was posted in Uncategorized on July 10, 2014 by renounceuscitizenship. The above tweet references a comment to the Allison Christians revelation that the U.S. Treasury has no authority to enter into IGAs. The retirement plans of Canadian citizens who are considered to be U.S. taxpayers will be subject to taxation in both Canada and the U.S. – pure double taxation. In other words, you work you whole life for retirement only to see the plan subject to double taxation. Assuming the truth of this (and I intend to do further extensive investigation) it is absolutely essential that you renounce U.S. citizenship at the earliest possible moment. It is my sincere hope that this commenter is incorrect. But, I will find out. I hope you are sitting down before you read this. This entry was posted in Are you a U.S. 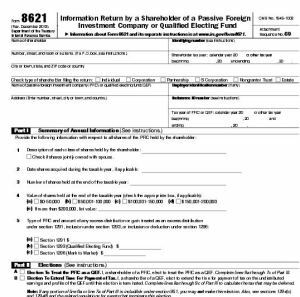 citizen?, Citizenship-based taxation, Retirement planning for Americans abroad and tagged Canada U.S. tax treaty, U.S. taxation of Canadian retirement accounts on July 6, 2014 by renounceuscitizenship. This entry was posted in Uncategorized on July 6, 2014 by renounceuscitizenship. Exactly three years ago, I posted a simple quiz about libertarians and patriotism. The two questions in that quiz are illuminating since they highlight how libertarians in some cases may differ from conservatives (click here for more on that issue), but I also included this t-shirt, which seems to capture the mindset of a lot of Americans regardless of their political outlook. Well, it seems that Mark Twain had the same attitude as the young lady in the photo, at least if we can believe the quote in this Steve Breen cartoon. Simply stated, our loyalty should be to a set of ideals, not to any particular group of people who happen to hold power. 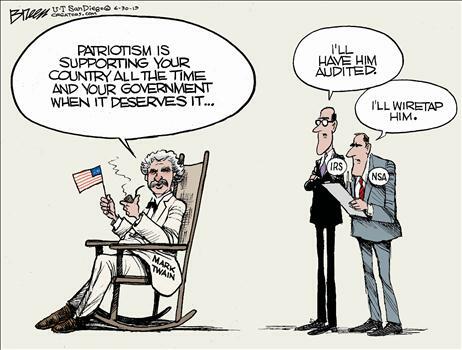 What makes the cartoon so effective, though, is the inclusion of an IRS thug and a snoop from the NSA. Reminds me of this cartoon about Obama and the Founding Fathers.